Here’s an updated shot from the Illustration Green Room, where a growing mob of robot characters are more or less patiently waiting for their appearances. We’re running out of magazines in there. For those who came in late: after several self-published books, I’ve been experimenting with that whole (very) long process that we’ve come to know as "traditional publishing". That process usually starts with a writer contacting a bunch of literary agents (in this case, twenty-one). That was my Phase One. Apart from a terrific response from my first choice, the results of my agent search went pretty much the way they go for everybody else. I do have one unusual hold-out who’s still planning to read the book even though he’s encouraged me to embark on Stage Two. In Stage Two, instead of risking humiliation and despair at the hands of literary agents I go directly to the source of humiliation and despair: editors! Even those writers who pass the trials of what I’ve called Phase One still have a Phase Two to face; in their case it’s the agent who submits to editors. Those of us who still don’t have agents end up in a slush pile of manuscripts that, for editors, is kind of like the Augean stables. Possibly in more ways than one. But – importantly – a slush pile resembles the Augean stables because it can never be exhausted. It just keeps piling up. You really don’t want your book in slush pile: there’s no way of knowing when it may come out. But I begin Phase One with a leg up, since an editor who noticed my posts about the book has asked to see it. So, for the moment, no slush pile for me. Just another, but completely different, long wait until there may or may not be news. That’s an encapsulated description of traditional publishing, and also of trench warfare. The agent search ran for a good six months, or… a six months, anyway, and Phase Two has a timetable that’s at least that horrifying. Especially if it turns out that I do have a slush pile in my future. 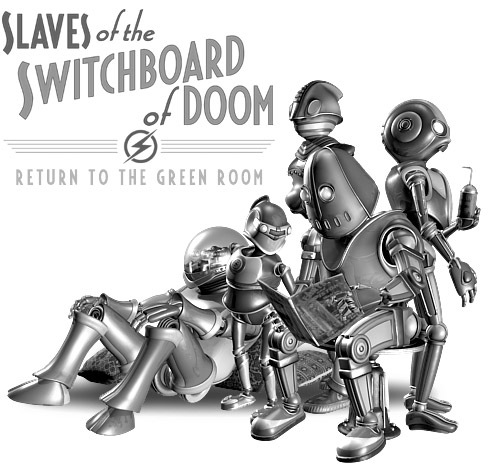 But in the meantime I’m still working on that freelance job I mentioned earlier, and so my work on the illustrations for Slaves of the Switchboard of Doom has been delayed. I’ve been building the robot models I need for some of the remaining pictures, but it would be difficult to work on the illustrations themselves until this side job is behind me. Hence: the state of the Green Room, above. 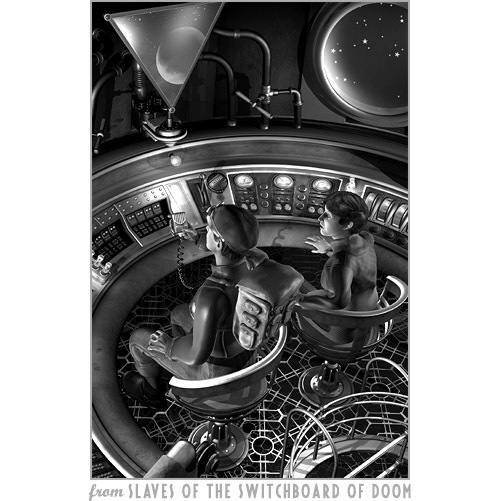 Here are Dash Kent and Nola Gardner in the cockpit of Dash’s Actaeon rocket, in an illustration for Chapter 19 of Slaves of the Switchboard of Doom. This is almost exactly like the office I wish I had. In the office I really do have, of course, something else is going on. A freelance project is slowing down my work on Switchboard‘s illustrations. I’ve been able to use the odd stray hour to build new robot models for several of the remaining illustrations – about six robots, so far – and Chapter 18 is looking pretty good, too, in its not really ready yet state. The clock is running out on Stage One of my experiment with traditional publishing. Before I start Stage Two I want to make some minor revisions to the manuscript, based on some of the feedback I’ve gotten from readers (including me). The thing I enjoyed most about this was that he planned to ask them "Am I crazy for loving this book?" and although I didn’t tell him so I had this very clear mental image of him standing around with, you know, AUTHORS, in front of a fridge. He had a milk carton full of my book in his hand, and he was saying "Does this smell bad to you? It doesn’t smell bad to me. Does it smell bad to you?" This is the way my mind works. I’m not saying it’s a good way. It’s just the way I’ve got. Anyway, freelance work may prevent me from finishing the illustrations quite as soon as I planned: but Stage Two will be its own shambling horror show of excruciating slowness. Slowth? So I’ve probably got the time to spare.